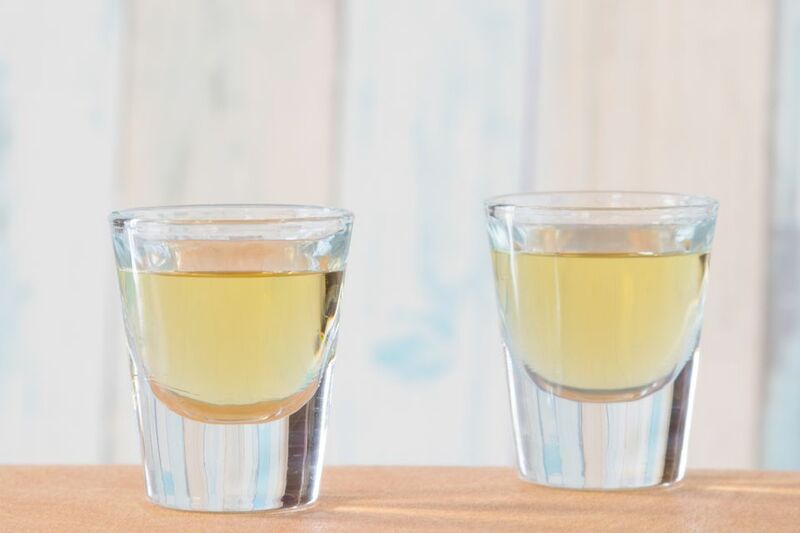 The Southern Joe is a very simple shot that uses two of the South's most famous liquors. It is one of the best-tasting shooters you'll find since it's essentially a fruity shot of Jack Daniel's. This recipe is beyond simple because all you have to do is pour and drink. There's no mixing, fussing with ice, or digging around the bar for special tools or mixers. You'll simply need a bottle of Southern Comfort, one of Jack Daniel's, and a shot glass! The ease of mixing it makes this a great shot for parties. Everyone's sure to enjoy how the apricot-dominated spice of SoCo plays with that signature taste of a great Tennessee whiskey. In a chilled shot glass, pour the two liquors. Since this shot is built directly in the glass, it doesn't come in contact with ice. Not only does that leave the liquors undiluted, but they're also not chilled and that can be a little too harsh. This—and any whiskey shot, for that matter—will go down smoother when served a little colder, which is why it's best in a chilled shot glass. Southern Comfort is a whiskey-based liqueur created in New Orleans, though for years it was—unknowingly to consumers—made with neutral grain spirits. That has changed and it's now made with North American whiskey from Sazerac, which is a big improvement. It has a flavor profile that cannot be matched by anything else on the market. The brand's secret recipe of fruits and spices mean that there is no really good substitute available. A popular way to drink a shot of Southern Comfort is with a dash of lime. That's a great approach to add an extra kick of flavor to the Southern Joe as well. Of course, you can use any Tennessee whiskey in this recipe, though your options are limited. Jack Daniel's offers a few different bottlings and any will be great in this shot. There are a few other producers from the state, with George Dickel being the other popular brand. Go ahead and explore your options and have fun with how they change this shot. No Tennessee whiskey in the bar tonight? Pour a bourbon instead. The flavor will be slightly different, but the basic profile will be the same, especially if you choose a robust, full-flavored whiskey. How Strong Is a Southern Joe Shot? An undiluted whiskey shot is going to get noticed because it's as strong as the liquors that go into it. Jack Daniel's Old No. 7 is bottled at 80 proof and the Original Southern Comfort at 70 proof. The two together make a shot with an alcohol content of 37.5 percent ABV (75 proof), which is right between the bottling strengths of both. However, both brands do produce bottles that are stronger than their flagships. The strongest Jack Daniel's is the Single Barrel Barrel Proof, which can range from 125 proof to 140 proof and it's expensive. Southern Comfort is also available in 80 proof and 100 proof bottles. Be careful when mixing these higher-proof alternatives, though. One shot can easily get you drunker faster and catch you by surprise!